Once again, Guerilla Union is giving hip hop heads everywhere the ultimate music festival as the official lineup for Rock The Bells 2012 has been announced and this year, Strange Music fans have even more to anticipate. 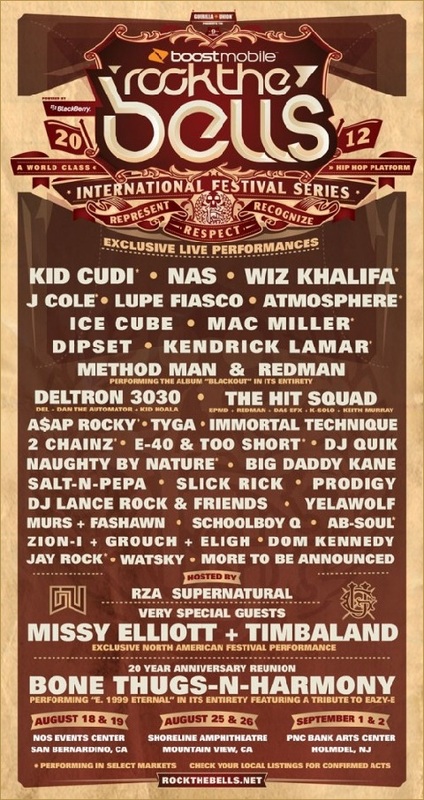 With a mind-blowing lineup that features exclusive performances from Kid Cudi, Bone Thugs N’ Harmony, Missy Elliot, Ice Cube, J. Cole, and many more, Rock The Bells 2012 will also include a special performance from Strange Music/TDE artist Jay Rock. Joined on the festival bill by the rest of Black Hippy, Jay Rock will only perform in select markets so be sure to check back for what is sure to be one of the biggest events in hip hop. After Tech N9ne conquered Rock The Bells in 2009, what will Watts’ finest have in store for fans? Stay tuned! Stay posted to RockTheBells.net for more. What do you think of the official lineup?